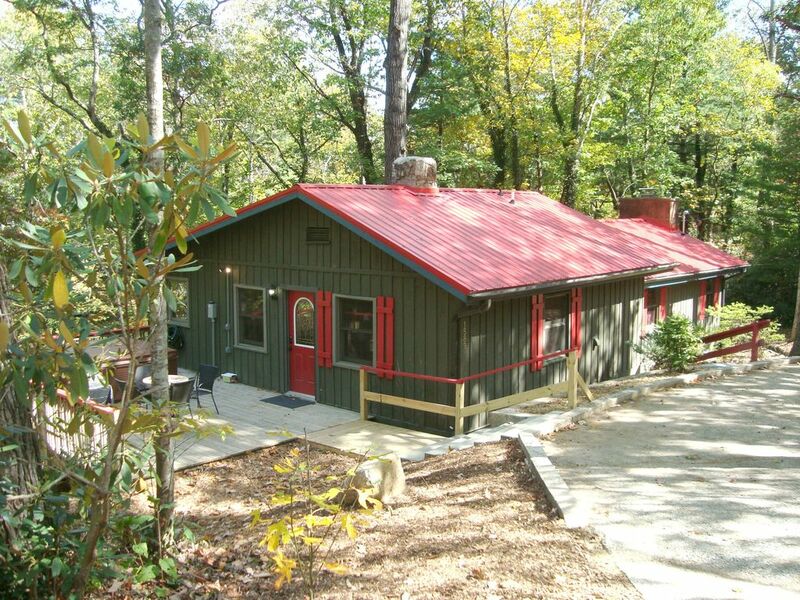 RED CREEK CABIN/Character!/Hot Tub/King/Massage Chair/WiFi/2 FP/Fire Pit/Creek! Red Creek Cabin: Bask in the warmth of historic charm in a lush forest setting with the sounds of rushing water from the creek below. Restored with love and tastefully updated with all the modern amenities, the Red Creek Cabin (2 Bedrooms & 2 Bathrooms) embraces you in luscious comfort and luxury. The cheerful red theme is first seen in the red metal roof when you enter the circular driveway and is reflected throughout the interior décor. Be enchanted with all the delightful amenities sure to spoil you: large hot tub, massage chair, high speed wireless Internet, plush king bed, attractive furnishings, large decks, screened porch, 2 gas log fireplaces, 52” HDTV & DVD movies, central heat & air, upscale washer & dryer and more! Kids will love the playground with fort, slide, swings and climbing wall. The sound of rushing water is intriguing and we made it easy to satisfy your curiosity by adding a magical stairway to the canyon below to the Featherstone Creek. You will love it! This lovely 1930s home has all new plumbing, wiring, central heat/air system, new bathrooms, new roof, and an updated kitchen with cottage charm yet with all new appliances including a dishwasher. The original living room with a stone gas log fireplace now serves as the romantic king bedroom. The home was doubled in size in the 1980s with a living room addition featuring a wood paneled 20 foot cathedral ceiling with a massive gas log fireplace and a wall of glass doors leading to a deck and stairway to the woodlands and stream below. This elegant room has comfortable sofas (1 is a queen sleeper), 52” HDTV with DVD player, large DVD movie library, massage chair, dining area and reflects the happy red theme. There is a small second bedroom with a pretty day bed and pull-out twin trundle. For babies, there is a crib, high chair and stroller. Children will enjoy the games, stuffed animals and kids’ books. LOCATION: 9 minutes from I-26 exit 44, this vacation rental is located in Hendersonville, NC. The RED CREEK CABIN sits on several lush acres of wooded forest with a rushing creek in the canyon below. It is 8 minutes from a large shopping and restaurant complex. This convenient location is 13 minutes from downtown Historic Hendersonville Main Street shops, galleries and restaurants. It’s a quick 30 minutes to downtown Asheville and the Biltmore Estate. YOU DESERVE TO BE SPOILED!!! With all the special touches, this is a warm inviting home rather than a “vacation rental house.” I promise you a meticulously clean & well-maintained home thoughtfully furnished with your every need in mind! I am a caring local owner who takes exquisite care of my 11 AshevilleVacationHomes properties and am available anytime to see to your needs. YOU are my full-time business! You may verify listing authenticity by doing an Internet search under the name “RED CREEK CABIN” in the Asheville NC area to locate my independent listing. I am Stephanie Joy Johnson. My passion is creating beauty in real estate….remodeling and restoring homes, landscape design, interior home décor and, best of all, making guests feel pampered when they stay at my personally owned luxury vacation homes in the gorgeous mountains of Western North Carolina. I devote myself full-time to taking care of my homes & guests. YOU are my full-time business! My business is called Asheville Vacation Homes. I began this business in 2004 and delight in finding beautiful locations and gorgeous homes for vacation rental settings. I am always searching for interesting furnishings (shopping!) to add to the delightful decor for my guests. During your stay, you also might meet my awesome property manager and “fix-it man,” David. He can take care of any maintenance or property issues should they arise. He and I are both available 7-days-a-week to make sure your stay is the best ever! Email me for my web address to see all 11 of my vacation homes. Take a virtual tour at AshevilleVacationHomes. INDULGE! You deserve to be spoiled at my vacation home! I am a caring local owner and answer all inquiries personally. RED CREEK CABIN is my latest "find." The original home was built in the 1930s loaded with lots of character and later (1980s ?) a beautiful addition doubling the size with exquisite wood covered walls & 20' ceiling living room....all with a view of the lush woods. When I found this home it needed an entire renovation but with lots of time, money, work and loving care, it is now a magnificent home you will love! I am passionate about living in these awesome Blue Ridge Mountains of Western North Carolina and adore sharing my vacation rental homes with guests who come to experience our area’s mountains & towns. I take exquisite care of my properties and am available anytime to see to your needs. I make sure each home is exceptionally clean, meticulously well-maintained and the hot tub sparkling with fresh water. I have lived in Asheville, North Carolina for many years and find great joy in discovering more and more reasons why this is the BEST PLACE IN THE WORLD TO LIVE! Asheville is consistently in the “Top 10 Places To Live” according to almost any criterion published! It’s a diverse multi-cultural blend of mountain folk and cosmopolitan society set in a dramatically beautiful mountain setting. It is my heart-felt desire to provide gorgeous welcoming homes in spectacular settings and to share this town with you! Featherstone Creek is a rushing stream located on the property. There is a special stairway down to the water. Gorgeous 20' wood ceilings, large gas log fireplace, 2 comfy sofas (1 is queen sleeper), 52" HDTV & DVD player, DVD movie library, wall of windows/sliding doors to deck and woods. Full Size Stainless Steel with French Doors and Freezer Drawer. Plenty of quality dinner dishes, drinking & wine glasses, quality flatware, etc. Charming with old and new. Fully remodeled; lots of cupboard space; equipment & accessories to please any chef! 52" HDTV with DVD player in Living room; TVs with built-in DVDs in both bedrooms. Large 6 person hot tub; water is always clean! We absoultey loved Red Creek Cabin. We stayed here during a 4-day conference and it was very comforting to come home, relax and unwind. Thank you so much for thinking of it ALL. Thank you for the five star review!! Glad you enjoyed your stay. We hope you return to our Asheville/Hendersonville and stay with us again. Not sure I could say anything the other reviews haven't already, but everything about our stay was perfect! We loved the cabin, and everyone is right, the little things made such a difference. Our kids loved the boards games, fire pit and play set. Our whole family loved having the hot tub to soak in after our hikes and busy days. The kitchen was well stocked, there wasn't anything we wished we had that wasn't available, down to a coffee grinder so we could bring our whole bean coffee! Location was also amazing for what we wanted to do while here. And the hosts were so amazing, they responded SO quickly to any question we had and helped us extend our stay when we decided we hadn't had enough! We will definitely return to stay here again. We absolutely loved our stay here. Darlene goes extra lengths to make sure her guests are happy and comfortable. The cabin is charming and we loved the quirkiness. The area is gorgeous as well. Can’t wait to come back! Everything was as described. Will definitely be back. This property is clean and cozy! My husband & I are from Ohio and came for New Years and had a wonderful stay. We hiked 2 days (Dupont State Park & Pisgah National Park). We enjoyed touring the Biltmore on New Years Eve and that was well worth the price and time...we spent the whole day there ! After the hikes we enjoyed and appreciated the massage chair and hot tub! We are excited about the area and plan on returning and renting the cabin again! Our family of 4 (plus dog!) stayed at the red creek cabin for the week of Christmas. Upon arrival we were very pleased to see the beautiful décor and special touches of Christmas sprinkled throughout the cabin. We found the cabin very comfortable, clean and cozy for our week away from home. Perfect for our purposes for the week, taking in some sights, spending Christmas together in the mountains and visiting several colleges. The kitchen was well stocked with spices, pots, pans... everything needed to prepare our meals for the week. Jacuzzi tub was ready to go! The location was perfect... close enough to downtown historic Hendersonville, Tryon and other quaint towns, yet under half an hour we were in Asheville. Thank you for making our first Christmas away from home so cozy and comfortable. The RED CREEK CABIN sits on several lush acres of wooded forest with a rushing creek in the canyon below. There are NO scary winding mountain roads! This in-town location is 8 minutes from a large shopping and restaurant complex. It is only 13 minutes from downtown Historic Hendersonville Main Street shops, galleries and restaurants. It’s a quick 30 minutes to downtown Asheville and the Biltmore Estate.